Flat washes and leaving a third white for balance. A great resource from Hawaii, a customer with a red purse, and surf boards for rent. On the Island of Kawaii we venture ever so often to take in the range of color and shapes of the land. This design below a is dominate vertical composition device with oval shape repetition. The introduction of waving line and varying widths holds this piece together. Learn everything you can about the pigments in your choice of media. Watercolor, Oils, Gouache, Pastels, Color Pencils, etc. . The pigment character transfers to all medium. Watercolor really shows pigment character simply because all you do is add a sugar for a binder and water to the paint. This will help you design. Setting Up Your Watercolor Palette, A Happy Day. Left is the Jones Palette Kit and methods to set up the palette. Included is the Robert Wood palette at the end and the method to set up this palette. Be sure and read to the end of the post there are several tips, not to miss. The Jones palette kit. Pictures a little blurry with light reflected off the palette. I first start by putting the paint tubes in the wells, this way I ensure the correct placement of the pigments. Note how the pigments go left to right following a color wheel. I began with Cadmium Yellow light continuing with adjacent yellow orange hues, red, to red violet. All the prismatic warm hues are on the upper half. The prismatic cool hues are on the lower half. The bottom left to right are earth pigments. I separate them from the prismatic hues. this is a personal preference. Prismatic hues are colors seen when light is shown through a prism. Unsaturated earth pigments do not show in a prism. Only a portion of the pigment is used to fill the Jones Kit Palette. That's all the pigment it will hold. This is very effective, especially if you wish to put fresh paint in the well for full saturation strength. Left to right the pigments are: M Graham company and all pure pigment, no mixtures put in a tube. Cadmium Yellow Light, Azo Yellow, Cadmium Orange, space, Cadmium Red Light, space, Alizarin Crimson, Quinacridone Rose, space, space, Ultra Marine Blue, Cobalt Blue, Cerulean Blue or Manganese Blue, Cobalt Teal, Permanent Green Light, Then the Earths along the bottom. Next to P.G.L. is Ivory Black or sometimes I use the mixture Paynes Gray, Indian Red, (just a small tube), Burnt Sienna, Raw Sienna and at the end Yellow Ocher. Space are left so students can add their own favorites. For example a Transparent orange or Winsor Red, or Carbazole Violet or Cobalt Violet. I will add other pigments as needed, for example using limited palettes of just three color harmonies. Use Sap Green in one of the spaces, especially when painting plein air. On the side of the palette I have written the names of the pigment and there quality (o) Opaque (t) Transparent (s) Staining and (g) Granulation. If you change a color the black sharpie pen comes off with finger nail polish remover. The supplies I use in my classes at the university. Note the foam core board under all the supplies. The foam core is used as a support for the water color paper. On the foam core I will place clear strapping tape to resist the water when painting. How to fill the wells: Start at the bottom of the well and fill in the pigment corner to corner in a nice even and flat surface. This will prevent water from pooling and creating mold in the palette. and may take a little longer to create a film over the top. Keep your pigments moist, pigments come out of the well much more vivid and saturated then if they become bone hard. Many a good brush has been ruined trying to get pigments out of a bone hard well of pigment. The beauty of watercolor is after you have your palette set up you are able to just add more pigment to the well as it becomes empty. Below is a Robert Wood Palette with wells around the circumference. The yellow is placed to the center right, then going left and across the top are all warm colors. Back to the yellow center, then going right and along the bottom of the palate are cool colors. When complete the palette looks like a color wheel. My earths are placed along the left side of the palatte. I have a personal preference to have them together. When setting in a workshop I place the Wood Palette vertically with yellow at the top this gives more room on the table. • You need a good design with white shaped areas balanced through out the composition. • Be sure your format and composition are the same size. • Do sketches, a black and white value painting and color study. • Do this assignment on a quarter sheet. Half sheet if you would like to try one. This is a good assignment for a ½ sheet watercolor. Standard Skill: Students will be able to execute a balanced painting by leaving white in their design . Leaving white is what we use instead of using white pigment. Outcome: Students will experience the freshness and beauty of leaving white paper. The term glow and luminosity. Will become evident. *Below is a (leaving whites) painting and the black and white value resource. Here is also a resource of a photo of the Grand Teton on the north side and the quarter sheet demonstration done in class. Here is also a painting of leaving whites of Holly Hocks. 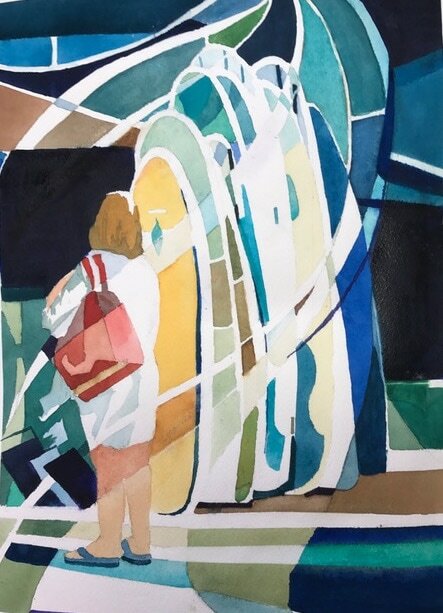 Leaving whites is one of my favorite watercolor compositions to paint. Let me know if this helped by pushing like. Here are some wonderful Atmospheric Glazing methods, plus Glazing vs. Mixed Washes. Good shapes are vital in negative painting. 1. Start by drawing good shapes. DRAW. 2. Watch for the Negative Space. That is the holes between the shapes that you could place your hand through without touching the object. WATCH SPACE BETWEEN SHAPES. · Also called Notan, a Japanese word meaning dark-light. It is the design principle defining the interaction between positive (light) and negative (dark) space. *See Notan by Dorr Bothwell and Marlys Mayfield. 3. Begin by painting a very pale mingled wash on your 1/8 sheet watercolor paper. Let it dry. 4. Paint around each shape you have drawn by using a light flat or graded wash. This is called Glazing or Layering. THIS IS BEST OBTAINED BY THE USE OF TRANSPARENT PIGMENTS. Cobalt, Quinacridone Rose and Azo Yellow or Aureolin . 5. Redraw more shapes paint around those. Keep building the design. 6. Build your design from Light to Dark shapes. * Note Barbara Swenson YouTube demo.